This is a guest post by Martin Demiger. Most people think that a hobbies and interests resume section is a silly addition, but that’s only true if you include silly hobbies and interests. It can actually be a very helpful addition to showcasing who you are, your personality and your capacity for work. Potential employers will appreciate that you put in the extra effort to tell them a little bit more about who you are as a person. Did you include a hobbies section in the last resume you sent? Why have a hobbies and interests section? 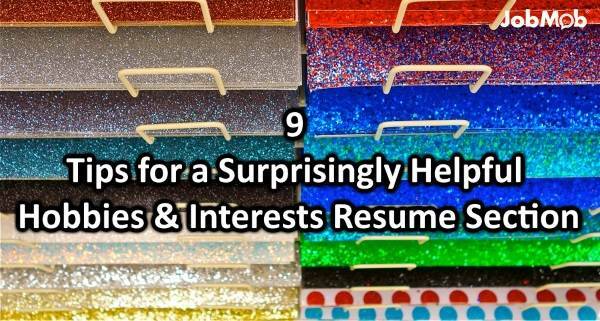 Most people do not list their hobbies and interests on their resume, so this alone will immediately make your resume different. You’re opening up topics of discussion if you’re contacted for an interview. Hobbies and interests can show off how likable you are and how easily you’ll mesh with future colleagues. If the job you’re seeking and your hobbies or interests coincide, don’t be afraid to play that factor up. For example, if you are applying to a restaurant for the job as a chef or even a cook, list that you are passionate about cooking and food and devote a lot of your spare time to the kitchen. Put your hobbies and interests that you think a potential employer will relate with the most, and this may need to change from employer to employer. Don’t just list things to try and impress a potential employer. If you end up interviewing for or even getting the position, any lies will probably come back to haunt you. You should be able to discuss and demonstrate your interests. This may sound cliché, but be ready to show off your skills if asked. If you listed “reading”, be able to talk about the last few books you’ve read and share your thoughts with potential employers. Add the hobbies that come across as a positive and fun use of your down time. For instance, if you enjoy playing poker, it shows that you like to be mentally engaged and utilize strategy. Sports are also a great hobby to include, as it shows you’re active, like to exercise and are a team player. If it interests you, your eyes will light up when you talk about it and employers will take notice. If you love rock climbing, share it on your resume. Not only is it athletic and impressive, but it highlights your sense of adventure and willingness to take risks — something that a future employer may appreciate. Instead of saying “reading” is an interest, be specific about what you love to read, whether it is a specific author or time period. For instance, don’t just say that you enjoy Shakespeare – be specific about which works move you the most. You don’t want to bore the employer by going on and on. Keep it short and sweet yet informative — this could be the difference between getting your foot in the proverbial door or getting your resume filed with a ton of others. If applying for a job via an online application form, do not leave the hobbies and interests section empty as potential employers can view this negatively. Inversely to the above, it says to an employer that you are not very well-rounded, don’t like to open up personally and may not be a good asset to their team of employees. Now some more suggestions of hobbies and interests to include and why. This shows you like to be mentally stimulated and have an imagination. Mention latest, most relevant book. Tells an employer you are not afraid to venture out into the world and experience new things. Mention most relevant recent destination/event. Music is something that everyone has in common, so it’s a no-brainer to include it in the hobbies and interests section of your resume, but mention which kinds of music. The more you tell a possible employer about yourself, the better odds that your resume will stand out among others in getting you the interview and ultimately, the job. After reading this article, will you add a hobbies & interests section to your resume? Tell us in the comments. READ NEXT: Do You Need Help Writing A Resume? This article was brought to you by Martin Demiger. Subscribe to JobMob via RSS or email and follow me on Twitter for more killer resume writing tips. Very true and informative. Hobbies are usually listed at the end of the CV and are usually discussed towards or right at the end of the interview. So the way one puts across his/her hobbies can give one a good parting shot. Well described hobbies can be a game changer. Hey Oliver, do you have any hobbies that are resume-worthy? can shopping be mentioned as a hobby for a fresher in a it company?? I think so shopping is not unique things that u mention in your CV one things when u mention hobbies in your resume then u should proper know about those things example if u mention reading novel then they will ask which novel u read tell me story about those novel. basically they check the your communication skill and confidence in PI round or HR round. can i also include in hobbies…? Thank you very much. I found this most helpful. I have left this section off my CV as a teacher for a long time but just felt the need to add it back and so researched and found your info. It is a new fresh way of looking at it and helps me to write it in an interesting way. Can I mentioned clicking a photo and also editing a photo in hobbies on a resume ?? CAN I MENTION “SPORTS AND FILM” AS MY INTERESTS IN RESUME? can i write teaching as a hobby?? I write poetry , how to mention that in my resume? It depends on what kind of job you’re looking for, but it’s a sign of a creative personality, which is often under-rated outside of creative professions such as design or entertainment. Only mention it if you’ve been writing poetry for more than a year or have many poems you could show. If you’ve been doing it for years, say that.